ไม่กี่เดือนถัดมา นักดาราศาสตร์คนอื่นซึ่งไม่ได้เป็นสมาชิกตำรวจอวกาศ ได้ตรวจพบสิ่งที่พวกเขาค้นหา วันที่ 1 มกราคม ค.ศ. 1801 จูเซปเป ปิอาซซี ประธานสมาคมดาราศาสตร์แห่งมหาวิทยาลัยปาเลร์โม ซิซิลี พบวัตถุเคลื่อนที่ชิ้นเล็กๆ ในบริเวณที่คาดคะเนโดยกฎของทิเทียส-โบเด เขาเรียกวัตถุชิ้นนั้นว่า ซีรีส ตามชื่อเทพเจ้าโรมันองค์หนึ่ง คือเทพีแห่งการเก็บเกี่ยวและผู้พิทักษ์เกาะซิซิลี ในตอนแรกปิอาซซีเชื่อว่าวัตถุนั้นคือดาวหาง แต่เนื่องจากมันไม่มีโคม่า มันจึงน่าจะเป็นดาวเคราะห์ สิบห้าเดือนต่อมา โอลเบอร์ค้นพบวัตถุชิ้นที่สองในบริเวณฟากฟ้าเดียวกัน คือ พัลลัส มันไม่เหมือนดาวเคราะห์ดวงอื่นๆ เพราะปรากฏเป็นเพียงจุดแสงไม่ว่าจะใช้กล้องโทรทรรศน์ที่มีกำลังขยายสักเท่าใด นอกจากการเคลื่อนที่ของมันแล้ว ก็แทบไม่แตกต่างไปจากดวงดาวทั่วไปเลย ต่อมาในปี ค.ศ. 1802 วิลเลียม เฮอร์เชล เสนอให้จัดประเภทวัตถุเหล่านี้เป็นอีกชนิดหนึ่ง ให้ชื่อว่า "ดาวเคราะห์น้อย" (asteroid) ซึ่งมาจากภาษากรีกว่า asteroeide หมายถึง "เหมือนดวงดาว"
↑ 1.0 1.1 Krasinsky, G. A.; Pitjeva, E. V.; Vasilyev, M. V.; Yagudina, E. I. (July 2002). "Hidden Mass in the Asteroid Belt". Icarus 158 (1): 98–105. doi:10.1006/icar.2002.6837. ↑ 2.0 2.1 Pitjeva, E. V. (2005). "High-Precision Ephemerides of Planets—EPM and Determination of Some Astronomical Constants" (PDF). Solar System Research 39 (3): 176. doi:10.1007/s11208-005-0033-2. ↑ 4.0 4.1 Yeomans, Donald K. (July 13, 2006). JPL Small-Body Database Browser. NASA JPL. Retrieved on 2007-04-25. ↑ 5.0 5.1 5.2 J. Hilton (2001). When Did the Asteroids Become Minor Planets?. US Nava Observatory. ↑ 6.0 6.1 Dawn: A Journey to the Beginning of the Solar System. Space Physics Center: UCLA (2005). ↑ 7.0 7.1 Michael Hoskin. BODE'S LAW AND THE DISCOVERY OF CERES. Churchill College, Cambridge. ↑ 8.0 8.1 "Call the police! The story behind the discovery of the asteroids" . Astronomy Now (June 2007): 60–61. ↑ Prof. Richard Pogge (2006). Introduction to Solar System Astronomy: Lecture 45: Is Pluto a Planet?. An Introduction to Solar System Astronomy. Ohio State University. ↑ DeForest, Jessica (2000). Greek and Latin Roots. Michigan State University. ↑ 12.0 12.1 Staff (2002). Astronomical Serendipity. NASA JPL. ↑ Is it a coincidence that most of the planets fall within the Titius-Bode law's boundaries?. astronomy.com. ↑ Hughes, David W. (2007). A Brief History of Asteroid Spotting. BBC. ↑ A Brief History of Asteroid Spotting. Open2.net. ↑ Masetti, M.; Mukai, K. (December 1, 2005). Origin of the Asteroid Belt. NASA Goddard Spaceflight Center. ↑ Watanabe, Susan (July 20, 2001). Mysteries of the Solar Nebula. NASA. ↑ 20.0 20.1 Petit, J.-M.; Morbidelli, A.; Chambers, J. (2001). "The Primordial Excitation and Clearing of the Asteroid Belt" (PDF). Icarus 153: 338-347. ↑ Edgar, R.; Artymowicz, P. (2004). "Pumping of a Planetesimal Disc by a Rapidly Migrating Planet" (PDF). Monthly Notices of the Royal Astronomical Society 354 (3): 769–772. ↑ Scott, E. R. D. (March 13–17, 2006). "Constraints on Jupiter's Age and Formation Mechanism and the Nebula Lifetime from Chondrites and Asteroids". Proceedings 37th Annual Lunar and Planetary Science Conference, League City, Texas: Lunar and Planetary Society. ↑ Taylor, G. J.; Keil, K.; McCoy, T.; Haack, H.; Scott, E. R. D. (1993). "Asteroid differentiation - Pyroclastic volcanism to magma oceans". Meteoritics 28 (1): 34-52. ↑ Karen Kelly (2007). "U of T researchers discover clues to early solar system". University of Toronto. ↑ Clark, B. E.; Hapke, B.; Pieters, C.; Britt, D. (2002). "Asteroid Space Weathering and Regolith Evolution". University of Arizona. Michael J. Gaffey (1996). "The Spectral and Physical Properties of Metal in Meteorite Assemblages: Implications for Asteroid Surface Materials". Keil K. (2000). "Thermal alteration of asteroids: evidence from meteorites". Planetary and Space Science. Baragiola, R. A.; Duke, C. A.; Loeffler, M.; McFadden, L. A.; Sheffield, J. (2003). "Impact of ions and micrometeorites on mineral surfaces: Reflectance changes and production of atmospheric species in airless solar system bodies". ↑ "From Dust to Planetesimals: Workshop at Ringberg Castle Germany" (2006). ↑ A. Kracher (2005). "Asteroid 433 Eros and partially differentiated planetesimals: bulk depletion versus surface depletion of sulfur". Ames Laboratory. ↑ Stiles, Lori (September 15, 2005). "Asteroids Caused the Early Inner Solar System Cataclysm", University of Arizona News. ↑ Berardelli, Phil (March 23, 2006). "Main-Belt Comets May Have Been Source Of Earths Water". Space Daily. สืบค้นเมื่อ 2007-10-27. ↑ Lakdawalla, Emily (April 28, 2006). "Discovery of a Whole New Type of Comet". The Planetary Society. สืบค้นเมื่อ 2007-04-20. ↑ Yeomans, Donald K. (April 26, 2007). "JPL Small-Body Database Search Engine". NASA JPL. — การค้นหาดาวเคราะห์น้อยในแถบหลักที่มีขนาดเส้นผ่านศูนย์กลาง >100. ↑ Tedesco, E. F.; Desert, F.-X. (2002). "The Infrared Space Observatory Deep Asteroid Search". 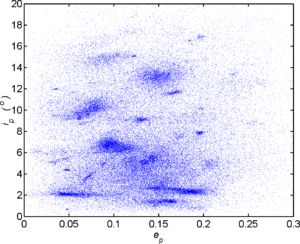 The Astronomical Journal 123: 2070–2082. doi:10.1086/339482. ↑ 36.0 36.1 Williams, Gareth (April 3, 2007). "Distribution of the Minor Planets". Minor Planets Center. ↑ 37.0 37.1 McBride, N.; Hughes, D. W. (1990). "The spatial density of asteroids and its variation with asteroidal mass". Monthly Notices of the Royal Astronomical Society 244: 513-520. ↑ 38.0 38.1 Wiegert, P.; Balam, D.; Moss, A.; Veillet, C.; Connors, M.; Shelton, I. (2007). "Evidence for a Color Dependence in the Size Distribution of Main-Belt Asteroids". The Astronomical Journal 133: 1609–1614. doi:10.1086/512128. ↑ Clark, B. E. (1996). "New News and the Competing Views of Asteroid Belt Geology". Lunar and Planetary Science. 27: 225–226. สืบค้นเมื่อ 2007-03-27. ↑ Lang, Kenneth R. (2003). "Asteroids and meteorites". NASA's Cosmos. สืบค้นเมื่อ 2007-04-02. ↑ 44.0 44.1 Ker Than (2007). "Strange Asteroids Baffle Scientists". space.com. สืบค้นเมื่อ 2007-10-14. ↑ Rossi, Alessandro (May 20, 2004). "The mysteries of the asteroid rotation day". The Spaceguard Foundation. สืบค้นเมื่อ 2007-04-09. ↑ เจ. โดนัลด์ เฟอร์นี (1999). "The American Kepler". The Americal Scientist 87 (5): 398. เก็บข้อมูลเมื่อ 2007-02-04. ↑ Liou, Jer-Chyi; Malhotra, Renu (1997). "Depletion of the Outer Asteroid Belt". Science 275 (5298): 375–377. doi:10.1126/science.275.5298.375. เก็บข้อมูลเมื่อ 2007-08-01. ↑ เอส. เฟอร์ราซ-เมลโล. (14–18 มิถุนายน 1993). "Kirkwood Gaps and Resonant Groups". ตีพิมพ์ในโอกาสครบรอบ 160 ปีของสหภาพดาราศาสตร์สากล: 175-188, Belgirate, Italy: Kluwer Academic Publishers. เก็บข้อมูลเมื่อ 2007-03-28. ↑ โจเซฟ คลาคกา (1992). "Mass distribution in the asteroid belt". Earth, Moon, and Planets 56 (1): 47–52. doi:10.1007/BF00054599. เก็บข้อมูลเมื่อ 2007-04-12. ↑ ดี. อี. แบคแมน (6 มีนาคม 1998). "Fluctuations in the General Zodiacal Cloud Density". Backman Report. NASA Ames Research Center. เก็บข้อมูลเมื่อ 2007-04-04. ↑ 53.0 53.1 วิลเลียม ที. รีช (1992). "Zodiacal emission. III - Dust near the asteroid belt". Astrophysical Journal 392 (1): 289–299. doi:10.1086/171428. เก็บข้อมูลเมื่อ 2007-04-04. ↑ Kingsley, Danny (May 1, 2003). "Mysterious meteorite dust mismatch solved". ABC Science. สืบค้นเมื่อ 2007-04-04. ↑ "Meteors and Meteorites" (PDF). NASA. สืบค้นเมื่อ 2007-10-17. ↑ "Breakup event in the main asteroid belt likely caused dinosaur extinction 65 million years ago". Southwest Research Institute. 2007. สืบค้นเมื่อ 2007-10-14. ↑ "The Final IAU Resolution on the Definition of "Planet" Ready for Voting". IAU (24 สิงหาคม 2006). เก็บข้อมูลเมื่อ 2007-03-02. ↑ "IAU draft resolution" (2006). เก็บข้อมูลเมื่อ 2007-10-20. ↑ "IAU 2006 General Assembly: Result of the IAU Resolution votes". เก็บข้อมูลเมื่อ 2007-03-29. ↑ Parker, J. W.; Stern, S. A.; Thomas, P. C.; Festou, M. C.; Merline, W. J.; Young, E. F.; Binzel, R. P.; Lebofsky, L. A. (2002). "Analysis of the First Disk-resolved Images of Ceres from Ultraviolet Observations with the Hubble Space Telescope". The Astronomical Journal 123 (1): 549–557. doi:10.1086/338093. เก็บข้อมูลเมื่อ 2008-09-06. ↑ 61.0 61.1 "Asteroid 1 Ceres". The Planetary Society. เก็บข้อมูลเมื่อ 2007-10-20. 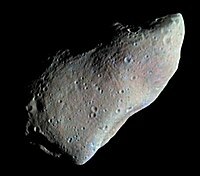 ↑ "Key Stages in the Evolution of the Asteroid Vesta". Hubble Space Telescope news release (1995). เก็บข้อมูลเมื่อ 2007-10-20. และ CT Russel et al. (2007). "Dawn mission and operations". NASA/JPL. เก็บข้อมูลเมื่อ 2007-10-20. ↑ Ker Than (2007). "Strange Asteroids Baffle Scientists". space.com. เก็บข้อมูลเมื่อ 2007-10-14. ↑ J. Torppa et al (1996). "Shapes and rotational properties of thirty asteroids from photometric data". Icarus 164 (2): 346–383. doi:10.1016/S0019-1035(03)00146-5. เก็บข้อมูลเมื่อ 2007-03-15. ↑ Larson, H. P.; Feierberg, M. A.; Lebofsky, L. A. (1983). "The composition of asteroid 2 Pallas and its relation to primitive meteorites". เก็บข้อมูลเมื่อ 2007-10-20. ↑ M. A. Barucci et al. (2002). "10 Hygiea: ISO Infrared Observations". เก็บข้อมูลเมื่อ 2007-10-21. 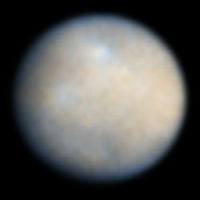 "Ceres the Planet". orbitsimulator.com. เก็บข้อมูลเมื่อ 2007-10-20. ↑ Hughes, David W. (2007). "Finding Asteroids In Space". BBC. เก็บข้อมูลเมื่อ 2007-04-20. ↑ อันเนอ เลไมเตร (31 สิงหาคม - 4 กันยายน 2004). "Asteroid family classification from very large catalogues". Proceedings Dynamics of Populations of Planetary Systems: 135-144, เบลเกรด, เซอร์เบีย และมอนเตเนโกร: สำนักพิมพ์มหาวิทยาลัยเคมบริดจ์. เก็บข้อมูลเมื่อ 2007-04-15. ↑ เคนเนธ อาร์. แลง (2003). "Asteroids and meteorites". NASA's Cosmos. เก็บข้อมูลเมื่อ 2007-04-02. ↑ Martel, Linda M. V. (March 9, 2004). "Tiny Traces of a Big Asteroid Breakup". Planetary Science Research Discoveries. เก็บข้อมูลเมื่อ 2007-04-02. ↑ ไมเคิล เจ. เดรค (2001). "The eucrite/Vesta story". 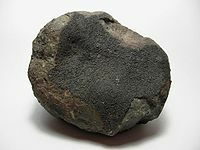 Meteoritics & Planetary Science 36 (4): 501–513. เก็บข้อมูลเมื่อ 2007-02-04. ↑ Love, S. G.; Brownlee, D. E. (1992). "The IRAS dust band contribution to the interplanetary dust complex - Evidence seen at 60 and 100 microns". Astronomical Journal 104 (6): 2236–2242. doi:10.1086/116399. เก็บข้อมูลเมื่อ 2007-04-11. ↑ Spratt, Christopher E. (1990). "The Hungaria group of minor planets". Journal of the Royal Astronomical Society of Canada. 84 (2): 123–131. สืบค้นเมื่อ 2007-02-04. ↑ "SwRI researchers identify asteroid breakup event in the main asteroid belt". SpaceRef.com. June 12, 2002. สืบค้นเมื่อ 2007-04-15. ↑ McKee, Maggie (January 18, 2006). "Eon of dust storms traced to asteroid smash". New Scientist Space. สืบค้นเมื่อ 2007-04-15. ↑ M. A. Barucci, M. Fulchignoni and A. Rossi (2007). "Rosetta Asteroid Targets: 2867 Steins and 21 Lutetia". Space Science Reviews. 128 (1–4): 67–78. doi:10.1007/s11214-006-9029-6. ↑ Stern, Alan (June 2, 2006). "New Horizons Crosses The Asteroid Belt". Space Daily. สืบค้นเมื่อ 2007-04-14. ↑ Staff (April 10, 2007). "Dawn Mission Home Page". NASA JPL. สืบค้นเมื่อ 2007-04-14. หน้านี้แก้ไขล่าสุดเมื่อวันที่ 9 สิงหาคม 2561 เวลา 11:37 น.